While we had plans to drive a 1400 mile route to Isle, Minnesota later in the day, a morning off from work meant a trip to the ice was necessary. With a chill in the air, we rode the snowmobile down to the lake and started punching holes. It was still mostly dark and the fish were lethargic. Working both sides of a weed edge, we worked through various depths of water searching out active fish. It seemed as if it was going to be another morning where breakfast was the best option! While we couldn’t throw in the towel quite yet, watching the sun growing on the shores across from us seemed as if time was still. If nothing else, the sun would give us a little optimism that the day would warm up. As the sun got closer, our holes expanded in that direction. We were all trying to chase down a beam of warmth to enhance our experience and that is what turned the bite in our favor! The fish were thinking the same thing! Following the sun line allowed us to stay on active fish. 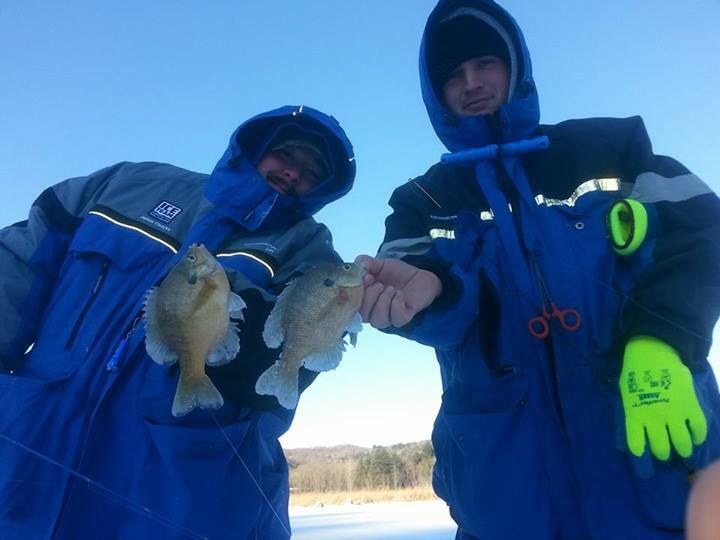 For a few hours, the bluegill and perch kept us plenty busy! Before we knew it, our morning had come to an end and it was time to think about loading up the truck for the long trek ahead!